When a recipe indicates that a sugar mixture needs to cook to a specific stage, the most accurate method to use is a candy thermometer to test the temperature as it is cooking. Cooking the sugar mixture to the proper temperature is critical for successful results in making candy. If you do not have a candy thermometer, the cooking stage of the sugar can be tested using the cold water method. See the information below on how to test for the different cooking stages of sugar. Forms thin threads when dropped in cold water. Used when making syrups, jelly, fruit liqueur, and some icings. Forms thicker threads when small amount is dropped in cold water. 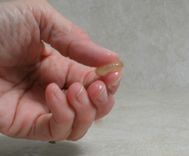 When the threads are removed form the water and rolled between your thumb and forefinger it will form a ball. The ball is soft and can be easily flattened when pressed between your fingers. Used when making fudge, fondant, pralines, creams, and buttercreams. When dropped in cold water and then removed, it can be formed into a hard ball. It will hold its shape but when squeezed firmly, it will flatten slightly. Used when making caramels. Hard Ball 250°F - 265°F / 125°C - 133°C When dripped from a spoon the syrup forms thick threads that when dropped in cold water can still be removed and molded into a ball shape. This hard ball will hold its shape and cannot be flattened. Used when making nougat, divinity, and marshmallows. Soft Crack 270°F - 290°F / 135°C - 145°C When syrup is dropped into cold water at the soft crack stage, it separates into hard threads but they are not brittle. When removed from the water these threads will bend a little before they break. Used when making taffy, butterscotch, and popcorn balls. Hard Crack 300°F - 310°F / 150°C - 155°C When syrup is dropped into cold water at the hard crack stage, it separates into hard brittle threads that when removed from the water cannot be bent without breaking. Used when making toffee, brittle, and hard candy. 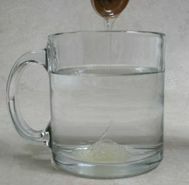 see Testing Using the Cold Water Method. A candy thermometer provides the easiest method of achieving accurate consistency of the different stages of candy making. 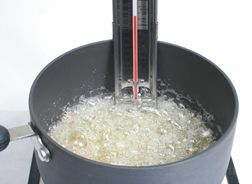 The thermometer has a movable clip that is used to connect and hold the thermometer to the side of the pan. The clip is adjustable so that the depth of the thermometer can be changed for different depth pans. To achieve an accurate reading the thermometer clip must be aligned on the thermometer so that it keeps the bulb from touching the bottom of the pan. Most candy thermometers will have the different stages of candy making marked on the temperature scale. These stages correspond to the cold water test for candy making. 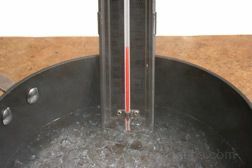 Traditional glass tube thermometers are built with vertical scales, which often have colored bars that serve as measures to display temperatures readings at various levels when they are reached. Ruler-style thermometers are built with vertical scales similar to the glass tube thermometer but the thermometer is designed more like a metal ruler. There are often different levels marked on the thermometer that indicate the various stages of the sugar mixture so that it is easier to determine when they are reached. Dial readouts will display temperature levels registered on a full circle of numbers to show when various levels are achieved. This type of thermometer will often be designed with a steel shaft probe sensor that is inserted into the liquids or substance to take the heat reading. Digital readout thermometers, which are battery operated, will typically display each temperature range as the heat reaches the levels of soft ball, hard ball, soft crack, and the other designated levels. Other features on the digital readout thermometers may include beeping tones to signal when set temperatures are reached. When selecting a candy thermometer consider the following points to determine the type that would be most suited for your needs. Consider the ease with which the thermometer can be read. What types of display for the temperature readings are shown on the thermometer, such as centigrade, Fahrenheit, highest, lowest temperatures, and other relevant display options? Which options fit your needs best? What is the minimum depth of contents that can be read by the thermometer? How is the thermometer designed to keep it from touching the bottom of the pan? Consider the potential for use in other cooking processes such as for fried foods, jellies, jams, or preserves. It is extremely important that you know whether or not your candy thermometer is accurate when you are using it to make candy. If the candy thermometer is not accurate it can affect the success of your candy making. Testing it for accuracy is easy to do and should be done each time you are going to use it. The simple steps are show below. 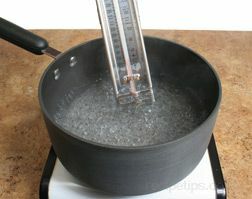 Bring a pan of water to a full boil and place the candy thermometer in the water. Do not let it touch the bottom of the pan. Allow the temperature to rise on the thermometer until it stops, approximately 10 to 12 minutes. If the thermometer is accurate it should read 212°F, at sea level. See boiling point for other altitudes below. If the thermometer reads higher or lower than 212°, you will have to adjust the temperature you are trying to reach by the difference. If it reads 214°, two degrees higher, you will have to increase your desired temperature by two degrees. If the recipe indicates to boil something to 234°, you will need to boil it to 236° when using that thermometer. If it reads 210° in the boiling water, you would decrease the desired temperature by two degrees. Note: Some types of thermometers can be calibrated so that they read correctly. Generally a tube or ruler type will not be adjustable but many times the dial and digital can be calibrated. See the instructions provided with the thermometer on how to calibrate. Adjust according to the boiling points below for altitudes above sea level. Bring the sugar mixture to a boil over medium-high heat. Once it is at a full boil turn the heat down to medium, making sure a steady boil is maintained. Insert a candy thermometer in the syrup, making sure the bottom tip of the thermometer is not touching the bottom of the pan. Allow the mixture to boil until it reaches the suggested stage for the recipe you are making. Watch the temperature closely and DO NOT LET IT GET PAST THE STAGE indicated by the recipe! Once it goes past the desired stage, it will not be suitable for the recipe you are working with. When you need to bring a sugar mixture to a specific heat stage, it is always the most accurate to use a candy thermometer but if you do not own one you can still check the sugar mixture by using the cold water method. Shown below are the different stages of cooking sugar. Bring the sugar mixture to a full boil over medium-high heat. Once it comes to a full boil turn the heat down to medium but be sure the mixture maintains a steady boil. As it continues to boil the temperature of the mixture will begin to slowly rise. The longer it cooks the higher the temperature will become. If the recipe gives an approximate amount of time to boil the mixture along with the stage it is suppose to reach, be sure to start checking the mixture 2 or 3 minutes before the suggested time is up. See how to test the different stages below. Pour one teaspoon of sugar mixture into cold water. Thin threads will form as it drops through the cold water. If you remove these threads from the cold water you would not be able to form a ball out of them. Pour one teaspoon of sugar mixture into cold water. It will form slightly thicker threads as it drops through the cold water. If you remove the threads from the cold water you will be able to form them into a small ball by rolling between your thumb and forefinger. The ball will be soft and can be easily flattened. Pour one teaspoon of sugar mixture into cold water. The threads can easily be seen in the water and when removed they can be formed into a hard ball. It will hold its shape but when squeezed tightly it can still be flattened slightly. Pour the syrup from a spoon into cold water. 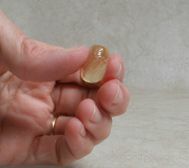 The syrup will form thick threads, which when removed from the cold water, can still able to be firmly molded into a ball shape. This hard ball will hold its shape and cannot be flattened. Drop a teaspoon of syrup into cold water. At the soft crack stage, it separates into hard thread but they are not brittle. When removed from the water these threads cannot be formed into a ball but will bend slightly before they break. Drop a teaspoon of syrup into cold water. At the hard crack stage the syrup will have darkened in color and when dropped in the cold water, it separates into hard brittle threads. When the threads are removed from the water they cannot be bent without breaking. Safety Note: When boiling sugar syrup, be extremely careful. The syrup is very hot and if it comes in contact with your skin it can cause severe burns. The syrup is thick and sticky, which makes it hard to wash off, causing it to continue to burn. Also, watch for splattering as the syrup cooks to higher temperatures.